Hello! Would you like to be a part of Scotland’s largest festival of architecture - the Architecture Fringe - and help make it the best it can be? Yes. Your support make’s a huge difference to what we can do and by supporting the Architecture Fringe you’ll be helping to grow and develop one of the most exciting grassroots creative platforms in Europe, encompassing the built environment, public space, art and politics. With your help we can bring the fourth edition of the ArchiFringe into being and connect with an active, engaged and informed audience. With over 250 participants and 8,000 visitors the Architecture Fringe audience includes architecture and built environment professionals, educators, designers and interested citizens at large. The festival has an active and responsive profile on social media, in the press, on and offline. Initiated by a group of architects, designers, photographers, engineers, visual artists, curators and musicians the Architecture Fringe is an independent contributor-led series of projects and events across the arts which explores architecture and its impact. It’s a platform that encourages and supports both ideas and agency. We believe in thinking, testing, prototyping and taking risks. We believe that it is our actions in response to our discourse that ultimately sets the tone for the culture that we create. The first-ever Architecture Fringe took place in 2016 inspired the Scottish Government’s then Year of Innovation, Architecture & Design and has developed into an annual event. The 2018 edition of the festival was the largest and most geographically widespread festival to date with 65 projects across Scotland from Inverness and Aberdeen through to Argyll, Glasgow, Cumbernauld, Fife, Edinburgh and the Scottish Borders. The Architecture Fringe also participated in the CANactions International Architecture Festival in Kiev, Ukraine where we shared what we do and presented the wider scene of contemporary architectural culture in Scotland to a new international audience. This year's Architecture Fringe provocation is In Real Life, [IRL] and invites participants to speculate on the extraordinary here and now - to explore and expose the conditions and contradictions in architectural culture, experiment with the every-day, challenge the ‘realities’ of our built environment and re-energise architecture’s role in creating better places and spaces, IRL. The Architecture Fringe 2019 will run 07-23 June across Scotland and will include a funded core programme exploring In Real Life and an open-platform programme of independent work. To help deliver the Architecture Fringe we have applied for public funding but we also rely on the warm support of individuals, organisations and companies. Any assistance would significantly help us to achieve our ambitions in the continuation of the festival as a positive force for good. 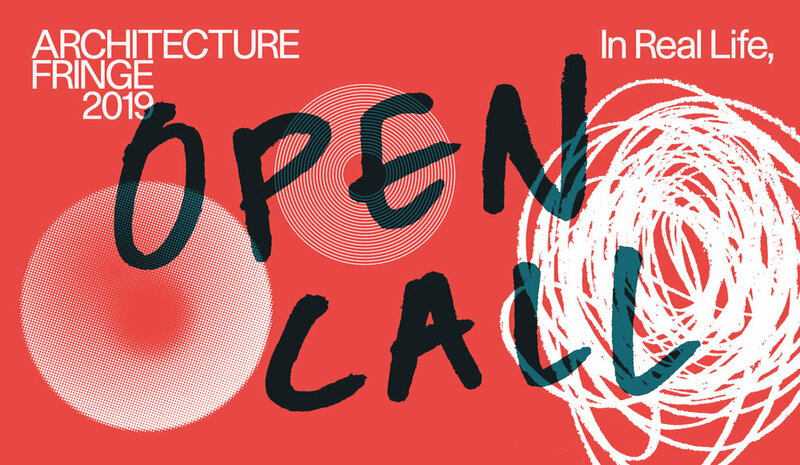 Today we launch our open call for Architecture Fringe 2019 - Submissions are now open, and you can read about this years theme and provocation here, IRL. We look forward to hearing your ideas! The programme for the Architecture Fringe 2018 will launch at 10am on Tuesday 1st May! This year the programme also reflects the growing geographic reach of the fringe, with activity from Abriachan, Forres and Aberdeen to Lochgoilhead, Dunoon, Glasgow, Croy, Cumbernauld, Stirling, Kelty, Edinburgh and Mellerstain. Some sneaky open programme teasers include a Salon de Refuses in Portobello where a celebration of rejection will take place for works that never were; a day of cultural and creative activism in land reform followed by a mid-summer evening of music, song and bonfire up above Loch Ness; a one-day cinematic marathon from dawn til dusk presenting all things architecture, design and Barbicania..; a sonic dialogue exploring our responsiveness to modern heritage in-situ at Craigsbank Church; and a raucous Turncoats debate on the slow-death financialisation of our art and architecture schools - cheery! Just a snippet of what’s on in June. The strength of the Architecture Fringe is the symbiotic energy, reflective inspiration and mutual support that the open and core programmes provide for each other on an annual basis. Since October at the monthly open meet-ups the Architecture Fringe production team has pitched, presented and taken feedback on this year’s core programme proposals. This well thought-through and carefully put-together programme of research, commissioned work, exhibitions and events under the COMMON/SENSES provocation was submitted for public funding in December. In March of this year we were informed that our submission to that month’s Creative Scotland assessment panel was unsuccessful. We understand that the panel were to assess almost £600,000 worth of work against an available budget of £290,000. No easy task. Any application seeking funding within the framework of the Open Project Fund system inherently carries the risk of being declined. On submission our application to Creative Scotland was internally assessed and scored 11 out of a maximum of 12 points. There was no detrimental queries or feedback. We would like to take this opportunity to thank our liaison officers at Creative Scotland who, for over three years now, have been incredibly responsive, supportive and encouraging towards the Architecture Fringe. With this in mind our core programme for the Architecture Fringe 2018 will be a little more nimble and fully utilise the funds and resources that we have. We will be exploring and establishing positions on a variety of critical topics within the COMMON/SENSES provocation through tours, events and exhibitions. These will subsequently be used to further inform our future work. There’ll also be our wonderful, amazing, always a rave-in-the-making Opening Party in Glasgow and our wonderful, provocative and high-profile Closing Lecture in Edinburgh. We would like to acknowledge and thank the support that will make this possible from the Scottish Government, University of Edinburgh, Helen Lucas Architects, GRAS, Custom Lane, Collective Architecture, Urban Pioneers, Calum Duncan Architects, Konishi Gaffney Architects and iGuzzini. Thank you to everyone who continues to support us and to all the open programme contributors for using the platform as intended. Good work! Full details for all will be revealed on Tuesday. Your support makes a huge difference to what we can do. By supporting the Architecture Fringe you'll be helping grow and develop one of the most exciting grassroots creative platforms in Europe. Our volunteer production team are highly skilled and experienced. Any financial assistance, at any scale, significantly helps us to achieve our ambitions for the continuation of the festival. We're delighted to announce that the Architecture Fringe will be participating in this year's CANactions International Architecture Festival in Kiev, Ukraine, 20-21 April 2018. A key objective for the Architecture Fringe is to engage internationally, to share what we do and to help present the wider scene of contemporary architectural culture here in Scotland. For CANactions we'll be out and about in the city creating a temporary intervention within the streetscape. This will be followed by a workshop where we'll be presenting what, how and importantly why we do what we do. We'll also introduce the work of Crumble Magazine and Voices of Experience to this new international audience. Agile City's Test Unit will be presented as a case study in prototyping public spaces. We'll finish the day off looking at Land Reform in Scotland, exploring community agency from both a historical perspective and through contemporary legislation and activism. You can view the Facebook event page here. Hello from our wonderful production team for the Architecture Fringe 2018! Hello! Your support make a huge difference to what we can do. Help us make the Architecture Fringe the best it can be. By supporting the Architecture Fringe, you’ll be helping to grow and develop one of the most exciting grassroots creative platforms in Europe. The Architecture Fringe was founded in 2015 by a group of architects, designers, photographers, engineers, visual artists and curators to encourage public debate about architecture and design in Scotland within its broader cultural and socio-political context. The inaugural Architecture Fringe took place in 2016 within the Year of Innovation, Architecture & Design. The 2017 edition of the festival hosted a funded core programme and work from 260 contributors through over 50 projects in 37 venues across Scotland. This year's Architecture Fringe is loosely structured around a thematic provocation entitled COMMNON/SENSES and will investigate our shared, intersectional experience within the urban environment in tandem with a more sensorial exploration of the spaces that we inhabit both off and online. Planning for this year’s ArchiFringe is well-underway with a developing series of core programme projects, exhibitions and events together with a number of engaging, and critical, projects on the open platform. To help part-deliver the Architecture Fringe 2018 we have applied for some public funding, but we rely on additional, warm, support from individuals, organisations and companies. All financial support for the Architecture Fringe is a huge help. Our volunteer steering group and production team are highly skilled and experienced. Any assistance, at any scale, would significantly help us to achieve our ambitions in the continuation of the festival as a positive force for good. Our sponsorship document provides further detail on our activity and notes how support for the Architecture Fringe will be recognised. We would be grateful, and delighted! if you could support us in any to help make the Architecture Fringe 2018 festival the best it can be. Creative Edinburgh Awards 2017 Nomination!! We're delighted that the Architecture Fringe has been nominated as part of the Creative Edinburgh Awards 2017! We've been shortlisted for the Collaboration Award which recognises an outstanding creative collaboration between two or more organisations or individuals. Our nomination is for the entire Architecture Fringe 2017 programme! - acknowledging the symbiotic relationship between the amazing and diverse open and core programmes and our volunteer production team. A massive, massive congratulations to everyone who took part in the Architecture Fringe 2017. With 260 contributors throughout the open and core programmes producing over 50 events and projects in 37 venues, the ArchiFringe this year was amazing. This nomination is for all of us together - well done to everyone!! Congratulations, too, to everyone else who has been nominated across the categories - we're in some wonderful company! The winners will be announced at the Creative Edinburgh Awards on 24 November 2017 at Codebase. Good luck everyone and thanks Creative Edinburgh for shortlisting us! Architecture is the most public of arts, entangled with conceptual and literal constructions of society and environment. It determines how we shape neighbourhoods and expresses the hopes and dreams of the communities we dwell in and move through. Yet, how do we see, hear and talk about architecture in public life? Beyond encounters in everyday life, architectural projects and the people who make them are usually exposed through professional and academic channels. They reach public audiences through grand design media stories when they often become controversial. Voices of Experience originated in a conversation between a practising architect, Jude Barber, and an architect educator, Suzanne Ewing and was inspired by the opportunities posed by the 2016 Architecture Fringe. Both were frustrated with the perennial blind spot in formal professional discourse towards the range and depth of work of women architects, particularly in the run up to the RIAS’ 2016 Festival of Architecture. Whilst there is increasing attention and research by organisations such as Parlour, AJ Women In Architecture campaign, and #EthelDay there is still much to be done. Voices of Experience is a collaborative project which has constructed a series of conversations between a highly experienced architect or maker of the built environment, and an architect or other professional at the outset of their career. It is the start of an on-going audio archive intended to be housed in the Glasgow Women’s Library. Each ‘conversation’ has a project or thematic concern in common and the participants discuss their work on location. The contextual focus is late twentieth century Scotland, at a time when we need to rethink the social and public purpose of architecture. Contributors to the project have included architect Margaret Richards, conservation architect Fiona Sinclair, architect/historian Dorothy Bell, teacher/architect Anne Duff, planner Kirsteen Borland, conservation architect Jocelyn Cunliffe and architect, Denise Bennetts. They have been joined by Mairi Laverty, Nicola McLachlan, Cathy Houston and Emma Fairhurst of Collective Architecture, planner Heather Claridge of Glasgow City Council, designer-activist Grace Mark and conservation architect Melanie Hay. Andrew Saint’s book, The Image of the Architect (1983), traces cases of the constructed idea of the architect as the authority, expert and sometimes genius supplanting master craftsmen at the helm of society’s architectural projects. During the 2016 Festival of Architecture the RIAS presented the image of the architect at the Scottish National Portrait Gallery with the ‘Out Of Their Heads’ exhibition. The exhibition displayed portraits of those who already had their image steadfastly fixed in society. The architects who had found places in public galleries and on wealthy private walls. A poster created during Glasgow 1999 City of Culture shows a male tribe of singular headshots entitled ‘Architects of Glasgow’. Making good architecture is a complex endeavour that is potently significant within our collective public life. We therefore need to pay more attention to the real sophistication of the production of our built environment - the teams, interrelationships and roles of expert practice positioned deeply within. Might we also extend beyond the narrow bounds of professional architectural culture? The authority of formally designated critics, designers and historians of architecture, validated by their media, professional or educational institutional status, tend to hold a monopoly on who can speak for and about architecture. What we love about the new Architecture Fringe platform is the inclusiveness of multiple viewpoints, emerging practices, experimental projects, reflective and collective stances. As an evolving open source web platform it offers a place to see, meet and make architectural culture in new ways. In a counterbalance to Saint’s Image of the Architect, Francesca Hughes’ edited book, The Architect: Reconstructing her Practice (1996) offers ways of re-thinking conventional tropes of the profession. Insights from our seven paired conversations and both Voices of Experience public events have been broad-ranging and generous. They have included ways in which architects discover their preoccupations, strengths, range and niche through different working relationships and formats; resonating experiences of women entering into architectural education decades apart; and the making and remaking of homes and work at different stages of life and outlook. Audiences at the Voices of Experience events have responded positively to the social history aspects of the conversations. They have also openly shared their own insights stating their favourite aspects of the project to be 'The modesty of these great architects’, ‘The variety of issues raised that show bold insights and achievements’ and ‘An insight into all aspects of architecture’. Voices of Experience has demonstrated an appetite to understand what architects actually do rather than what some selectively choose to show. Jude Barber is an architect and Director of Collective Architecture. Suzanne Ewing is an architect and head of ESALA (Edinburgh School of Architecture & Landscape Architecture) at Edinburgh University. Nicola McLachlan is an architect at Collective Architecture. The List Hot 100 2017!! We're delighted that the Architecture Fringe has been included within The List Magazine's Hot 100 for 2017! The countdown, as put together by the magazine, is of figures and organisations who've contributed most to Scotland's cultural landscape this year and we debut at number 65! Thank you so much to The List for including us. A massive, massive congratulations to everyone who took part in the Architecture Fringe 2017. With 260 contributors throughout the open and core programmes producing over 50 events and projects in 37 venues, the ArchiFringe this year was amazing. A huge thanks, too, to our wonderful hardworking volunteer production team. Well done to everyone!! A big, big thank you! to our wonderful funders and supporters - we couldn't do it without you. We hope you'll join us again. Onwards to the Architecture Fringe 2018! I first became aware of the Architecture Fringe when the 2016 programme was being planned. I saw tweets about it and I can remember thinking what an interesting idea it was (more interesting than the official Festival of Architecture being run by the RIAS). I even considered going to one of the start-up meetings. But I didn’t. And in the end, I didn’t go to any of the events. That’s a rather embarrassing admission. In my defence, I can only say that in July 2016 I was preparing to move house while struggling with chemo brain. That didn’t leave me with much headspace for anything else. Twelve months later, tweets about the Architecture Fringe 2017 events began to catch my eye: Piss Poor Planning?, Publishing House, Voices of Experience, Greener Grass? With more space in both my diary and my head this year, I decided to make up for lost time by attending as many events as I could. I was attracted to the Architecture Fringe by the breadth of its programme and its sometimes provocative themes. However, I was unprepared for the sheer creative, intellectual and political energy buzzing around the events. I came away from each debate, talk and exhibition with my mind full of ideas and creative energy. At this point, I should say that I’m not an architect, although I’ve spent most of my life working in architecture. It’s a field I love. I enjoy working with architects because, in my experience, they genuinely want to use their skills, expertise and imagination for the benefit of society. However, that’s not always easy in our current political and economic climate. Therefore, at the Architecture Fringe it was exciting to see how architects who are disenchanted with the mainstream practice of architecture are taking action (whether that’s by thinking, writing, exploring or doing) to change things. One of the highlights of the programme for me was the short film Architecture Working by the collective Architectural Workers at the Publishing House event. I also loved Dress for the Weather’s proposal for a self-running community centre, which was part of the New Typologies exhibition and talk. While it was great to witness so much constructively critical thinking, some of the Architecture Fringe discussions seemed rooted in a belief in a sort of architectural exceptionalism: the idea that architects alone can bring about change in the practice of architecture and in our built environment. I don’t think this is right. While some individual architects and practices may be able to work in radical new ways, it would be very difficult for the whole profession to do this without outside support and cooperation. Architects need the backing not just of clients, planners, cost consultants and contractors but also of politicians and the general public if they are to bring about meaningful change. With the Piss Poor Planning? Turncoats debate and the Essential Relationship networking event for architects and clients, the Architecture Fringe did provide a platform for some of the non-architects who have a powerful influence on the built environment. In future years, it would be interesting to have more contributions from outside the profession. Bring on the quantity surveyors and the fund managers who invest in student residences! Most importantly, architects need the support of the general public. Imagine what could be achieved if every voter started to campaign for more good quality social housing, more accessible public buildings and better public spaces. Given the opportunity at the Architecture Fringe, they could start by asking demanding questions of the cost consultants and fund managers. This reflection might give the impression that the Architecture Fringe is a very serious programme. At one level it is. But the events I attended were also very entertaining. The speakers were funny and irreverent; the discussions were lively and informal; and the audiences were sociable. Produced by a team of volunteers, the Architecture Fringe is independent of Scotland’s mainstream architectural institutions. That is a strength, and I hope it will remain independent. Putting on a programme like this is a huge commitment, and I’d like to thank the organisers for all their work. I’m already looking forward to the 2018 programme. Felicity Parsons is a freelance writer and writing skills trainer specialising in architecture. After living and working for many years in London, she moved to Glasgow in 2013. She attended Architecture Fringe 2017 events including the Civic House exhibitions, Piss Poor Planning?, New Typologies, Publishing House, Voices of Experience and Pop Up Cinema in Glasgow, and Greener Grass? in Edinburgh. This article was written on the back of a trip a few of us involved with the Architecture Fringe took to the Venice Architecture Biennale in late August 2016. The biennale theme was ‘Reporting from the Front’ and was directed by Alejandro Aravena. This piece wasn’t originally intended as a reflection on the Architecture Fringe, and it isn’t really, but thought it might be worth posting here. that the Biennale is what it is, (neither better or worse than the previous one I'd seen), so epic in scale that for any individual curator (or their 'theme') to have a discernible impact on the overall experience seems an ask too far. (David Chipperfield described it, in 2012, as like trying to curate the whole of Oxford street, and I imagine this to be a good analogy). In the face of this, any attempt to provide an overarching review or a meta-narrative that in any way summarises the broad range of exhibits, qualities or approaches that make up this festival of architecture would be an impossible task. What follows instead is an attempt to talk about some specifics. While the official ‘core’ festival is vast, the broader selection of parallel shows is enormous. Part of that extra-biennale programme is a retrospective exhibition of the work of Zaha Hadid and her practice, curated, produced and presented by the practice itself. While you might expect the work of one of the pre-eminnent architects of her generation (and one of the key names to break out of architecture circles and into the popular cultural imagination) to feature somewhere in the official programme, it doesn't. Regardless of what you think of her work, and her studios output, their ability to divide opinion is beyond discussion. The exhibition, given Hadid’s death earlier this year, and the way it was curated, was always in danger of becoming an extended eulogy – and this is the overriding impression that one takes away from it. Rich in visual material, from early paintings (for me the most interesting part of the show which illuminate a part of her practise that I was previously ignorant of) to models, to parametric prototypes and test constructions, the show feels like it is delivered with the volume turned up to eleven throughout - especially when also taking in the resplendent backdrop against which it is exhibited; the Palazzo Franchetti. Both models and images of projects are presented butted up against each other, leaving little room to step back and reflect, to really appreciate those astonishing buildings she has created, or to really make an assessment of where one ends and the next begins. But this visual energy is also perhaps one of the most intriguing things I took away from this show; the idea that architects able to operate at this level are essentially living out a complex set of ‘double-edged sword’ scenarios. They need to project the image of the single minded iconoclast but support and pay for an office of people to deliver the projects. They need to remain committed to their vision, but this necessary confidence brings with it (it seems) a fixedness of opinion and increasing inability to respond to context. In a side room, an accompanying documentary by BBC sycophant-in-chief Alan Yentob which was playing on loop, did nothing to help lift the tone of worshipping at the altar. However it did (through its recounting of Hadids early career) serve as a reminder of how hostile the profession can be to outsiders - something important to be reminded of. It would be ridiculous to suggest that Hadid hasn’t had a massive impact on architecture at the end of the 20th and start of the 21st century, but it would be equally ridiculous to discuss this without reference to the broader context of the practice as it developed and the way more recent work was sought and executed. The exhibition provided an insight in to this world, but due to its curation and curators, was weighted heavily towards the former rather than the latter. From an established superstar architect, to the young architect-planners-come-curators of the British Pavillion. The exhibition ‘Home Economics’, curated by Shumi Bose, Jack Self and Finn Williams sought to ask questions of domestic life - how we live today and how we might live in the future. Hyper-aestheticised, the sparse normcore design of the exhibit was a confident gesture but one that ultimately offered the viewer little beyond a cold and guarded millenial take on precarious work and its impact on the way we live. Organised around time periods - hours, days, weeks, months - the publication did go some way to fleshing out the premise and position of this installation, and was really an essential supplement. All the curators are good writers and connectors of content and ideas, but this seemed to be somewhat lacking here in a way that it isn’t in their other projects. The installation isn’t without its moments of lightness that give pause for reflection - the oversize Georgian-era door, or lyrical doormats - but these moments don’t seem to build to more than a succession of floating one-liners. Self and Bose are co-founders and editors of the Real Review, and some of the bite you might find in that publication would have gone a long way to engage the viewer and offer some routes in to the ideas and associated material. While the British pavilion could be said to have been underloaded with content, the same couldn’t be said of the Baltic pavilion. Located in a modernist gym hall near the Arsenale, this had both a lot in common with some of the other ‘grand-overview’ exhibitions that make up a significant part of the biennale, but in another way was operating to an entirely different logic. It was, on one level, a hotch potch of all types of content; photographs, artworks, scientific equipment, maps, videos. Focussing on the regions natural and man-made infrastructure (both its past and its future in a post-soviet context), this collaborative effort between the states of Estonia, Latvia and Lithuania was enthusiastic and energetic in both the type of material it was displaying and the imaginative way in which it displayed it. It gave you enough information to want to find out more, in a space where you could easily linger. It was accompanied by a beautiful publication, and used variety and texture to draw the viewer in, rather than stretching towards an over-simplified narrative. Between all of these elements it managed to create an experience that was both pragmatic, imaginative and speculative. The curation seemed influenced by recent turns in art towards the re-imagining and re-presenting of the 'archive', and the stripped back but often ingenious exhibition design (riffing off the context it found itself in) further enhanced the experience. Perhaps because thoughts of Brexit were front of mind at the time we visited, the idea of small independent states working in cooperation (with several projects looking further to links with Finland etc), served to re-affirm that (despite the political debates that probably arose from this attempt at a three-country pavilion) it was still possible to achieve something ambitious in cooperation - the whole, it seems, being greater than the sum of its parts. To conclude, away from the national pavilions, another exhibit that caught my attention was by Forensic Architecture - a research unit based out of Goldsmiths University, London. This fully embodied ‘reporting from the front’ - the practice is involved with aggregating and analysing the multiple data streams and rich media sources that now emminate from warzones and international incidents, and reassembling these fragments in to narratives that tell us a lot about people and power. They have completed a number of significant projects, including a study of the ‘left to die’ boat, a migrant vessel left to drift in open seas with no country willing to take responsibility for its stricken passengers. The key to this exhibition is its accessible content, which simply makes the assertion, in an incredibly visceral but non-hysterical way, that a Hellfire ‘bunker busting’ missile is a contemporary architectural tool. What we take from this and how we respond would be the next good question. I came to the ArchiFringe as an interested observer, having been aware of the inaugural 2016 planning meetings but unable to attend and with an initial degree of scepticism that it may simply be architectural events, for other architects. One of life’s less appetising prospects. What I discovered, however, was that it was something far beyond that. Well constituted, well directed and with an agenda that sought the widest public engagement. It arrives at an interesting time in Scottish Architecture. Set in the context of Lee Ivett’s recent piece in the Architectural Review, ArchiFringe 2016, to me, represented an encapsulation of the pertinent discussion points raised in the column. Building from grassroots level, the events contained within this year’s programme effectively demonstrated the presence of a passion and strongly rooted social agenda amongst a new generation of architects who are seeking, against much resistance, to find a voice and a place in a world mired with obstructive pre-qualification questionnaires and paralysing risk aversion. Multi-disciplinary work was also frequently in evidence, the aloof isolation of the traditional architectural mindset being pleasingly dismantled. The events that I attended were shorn of pretension, neatly straddling the interests of those directly involved within the profession and those who engaged to learn more. The constituent parts of the show held at Gayfield Creative Spaces were a good reflection of this. From the tangible, in the form of the tactile output of ‘Modern Ornament’ and the collected models of ‘The Macquette’ - a pertinent reminder that, in our increasingly digital world, a card hewn manifestation of the design process is invaluable, for both Architect and Client – to the more ethereal, expressed via the delicate linework of Tamsin Cunnigham’s ‘Peripheries & Outlines’. Sitting somewhere between the two, Robb Mcrae’s photographic study of well-loved and cherished homes, existing on the periphery of Edinburgh was an entirely sneer-free study of suburbia. So often derided in design circles, yet so often representative of the aspirations of those seeking a family home, in which to grow old, it was a perfect example of what I perceived (rightly, or wrongly) to be the ArchiFringe remit. Moving beyond the gallery environment, in acquainting myself with the volumetric realities of how much found rubble it takes to fill a gabion cage (a, literal, tonne), I also had the pleasure of satisfying a desire to design and build, relinquished of bureaucracy, thanks to Here&Now’s Space To Sit event. That this previous paragraph highlights an underlying selfishness, in terms of my own personal gain, is undeniable and, arguably, a common thread running through any such initiative – made evident by the overriding prevalence of groups constituted by ‘creatives’ that tend to assemble to participate in such things. The true engagement of the community is a difficult goal to achieve. In this instance, the considerable legwork undertaken, by Here&Now, in rehoming the various benches, across the city, ensures that the project leaves as broad a legacy as possible. A demonstration of the determination to reach out to as many as possible, as opposed to simply offering the few an opportunity to scratch an itch that’s often unreachable. If the trajectory of 2016’s events is continued in 2017, we are in safe hands. Government bodies, local authorities and those organisations that set out to represent the profession should seek to engage in their fullest capacities - those who wish to build a better future are already here, as the dismantling of existing entry barriers will reveal.